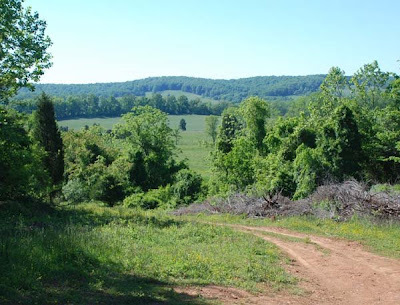 This site is on my friend Palmer Smith’s Property. Palmer who is also an artist, is in the process of building a house at this site and this is the view from what will be his front yard. He was gracious enough to let me come out and paint. 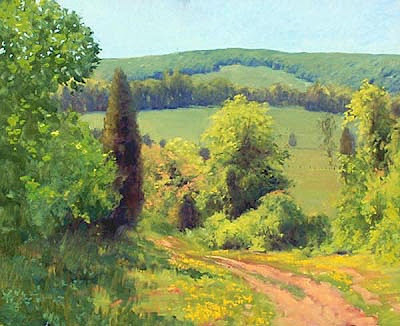 What attracts me to this scene is the energy of the lush spring growth here and the chance to paint the varied shades of green moving into the distance. 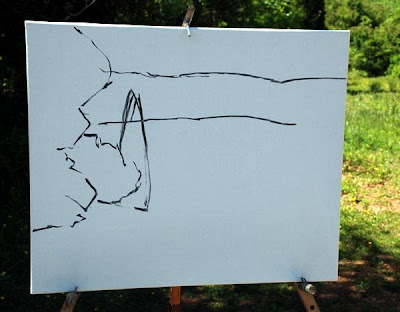 I start by quickly laying in the drawing with a large brush. I’ve already decided to leave out the deadfall on the right and continue the grasses and flowers in its place. 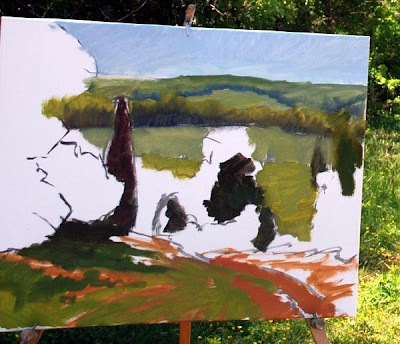 I’m not sure which way the sun is going to go so I block in my darks next, locking in the shadow shapes. Working from the back I lay in my large masses of color and value in the dark and middle ranges. Working all over the painting I build forms and add details. Right now the sky holes in the trees in the top left are too distracting for me. I want my center of interest toward the center of the painting just behind the road. Painting time for this canvas was two hours. Thanks for posting your process. 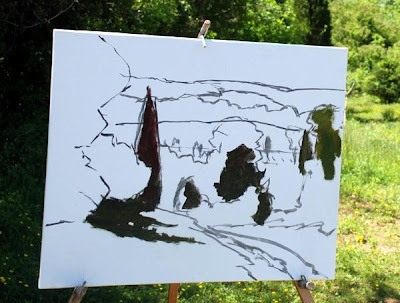 The warm underpainting definitely adds to the sunny mood you captured. Great painting, I used to live out that way. Beauty all around you, plenty of things to paint. Could you show the easel you have there? It looks rather light weight and I would love to see how it breaks down and travels. Did you build it yourself? If so could you show us how you built it? If you wouldn’t mind. Oh, I've seen those. Didn't recognize it in your photos. Thanks for the info and keep up the good work. I enjoy your posts. I noticed how you painted the bright leaves on the foreground trees and shrubs. They are more yellow than the photo. I have trouble with that at times. I often see white or silver leaves even when I squint. 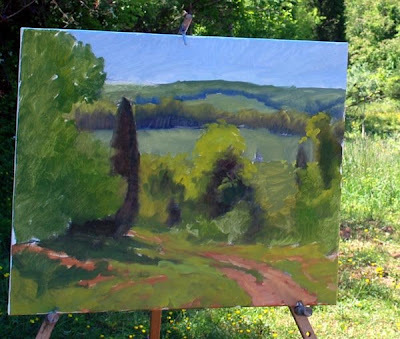 But white and green do not seem to work.To me the hardest things to paint are the brightest areas on green things. How do you deal with that? I have no specific answer for you, other than paint it how you see it relative to everything around it. Sometimes things are that bright. You have to be very careful when you compare though. Shiny things have bridgt highlights. 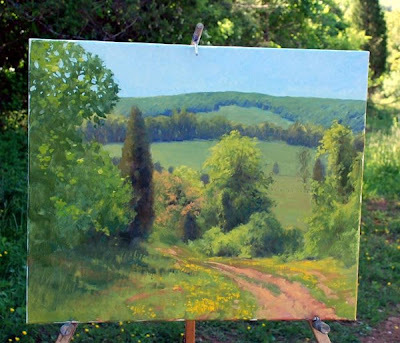 When you think something is very light, place the white cap of your paint tube or some other pure white object next to it, then stand back at your easel and look at them again and see if it really is as light as you think. Thank you for sharing your work process with us. 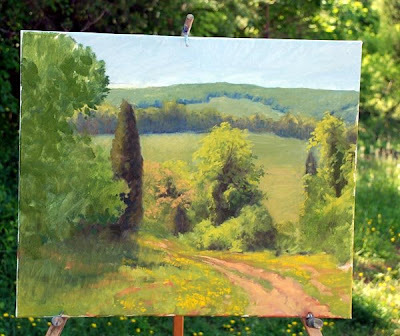 I don't paint plein air but hope to one day. This painting is great. Very much like UK scene.